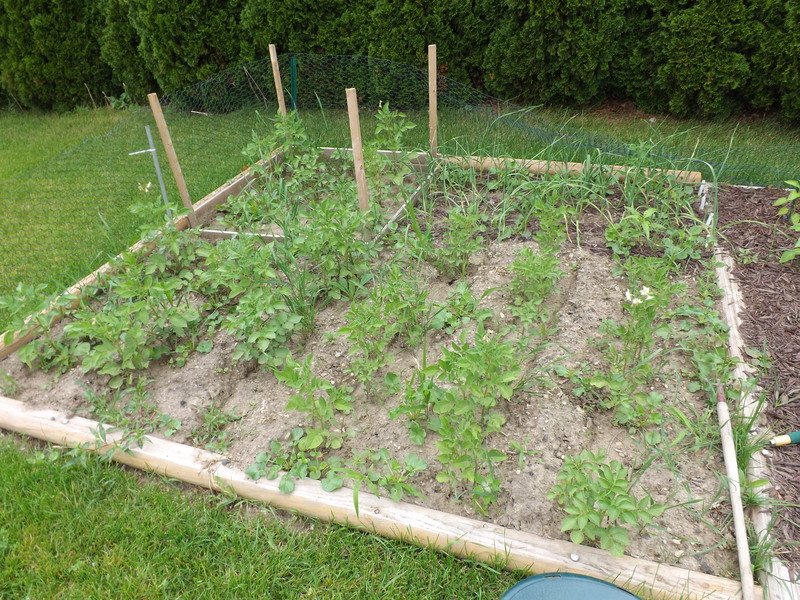 Over the weekend I decided something had to be done to tame the out-of-control pea plants in the garden. 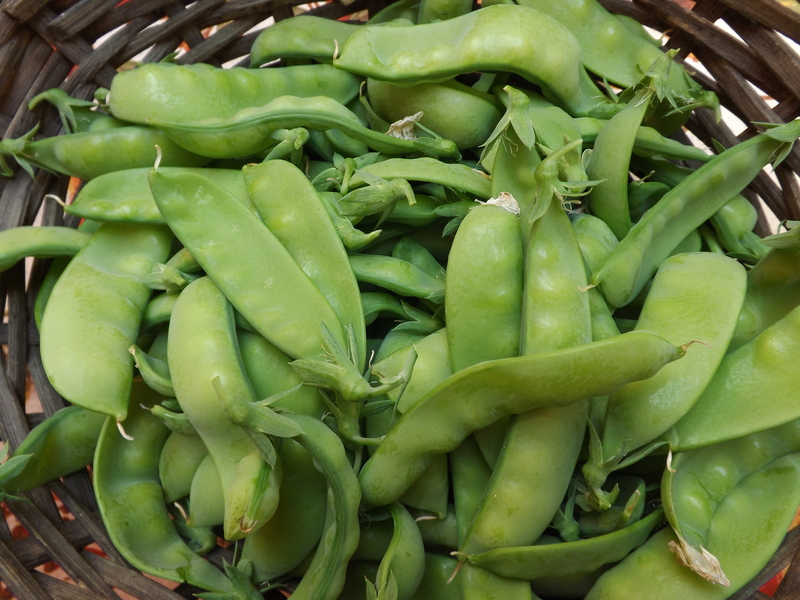 They were laying on the ground, weighed down by their height and all the peas. 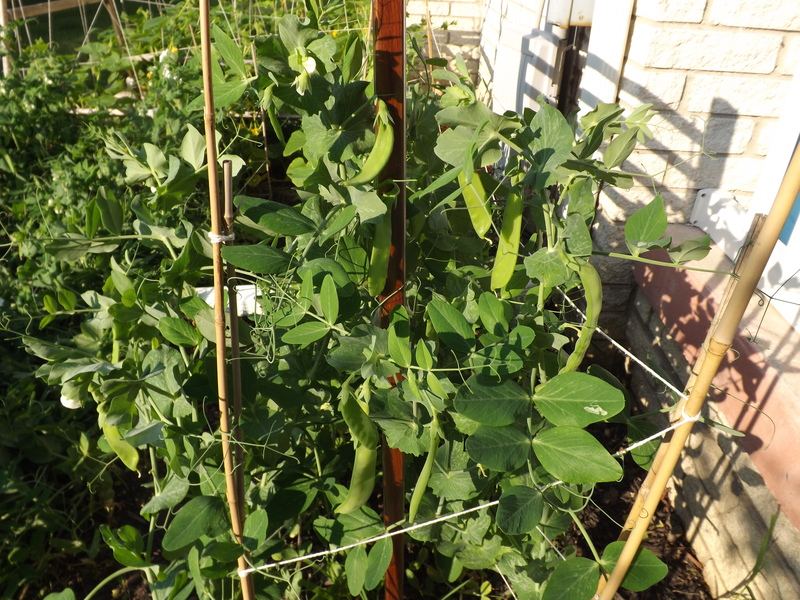 Only one section of the pea pods had a fence, made from an old crib section, to climb, leaving the rest of the garden free to grow wild. Having some scrap wood lying around I built a fence to hold up one of the rows. Seeing how well this worked, it was off to Lowe’s for some 1 x 2’s. Two hours later, the garden was under control and ready for picking. 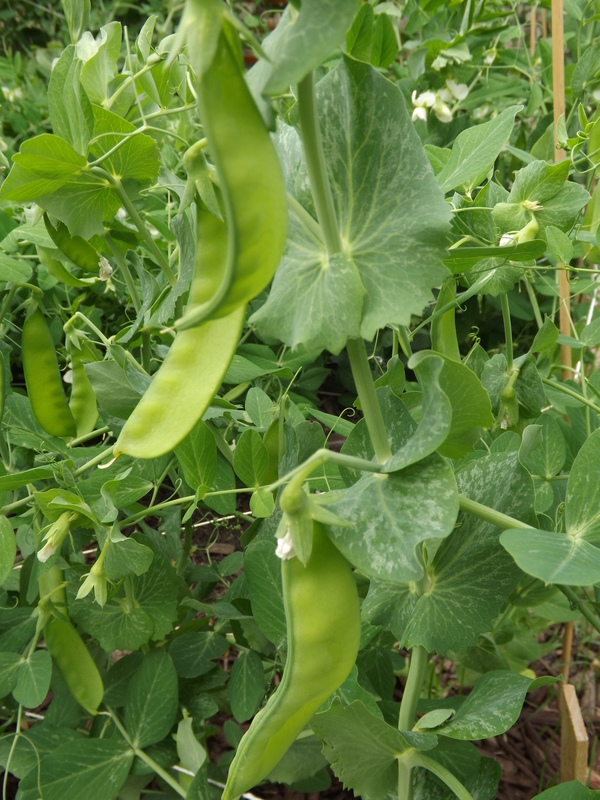 Now that the pea plants are tied to their fences and off the ground, I’m hoping to get even more pea pods and peas for freezing. Already the plants have begun to cling to the new fences and more flowers are beginning to form. Next it will be time to harvest the Early Peas and begin shelling them. Gardening is more rewarding than I ever imagined, and for this I am — Simply Grateful. 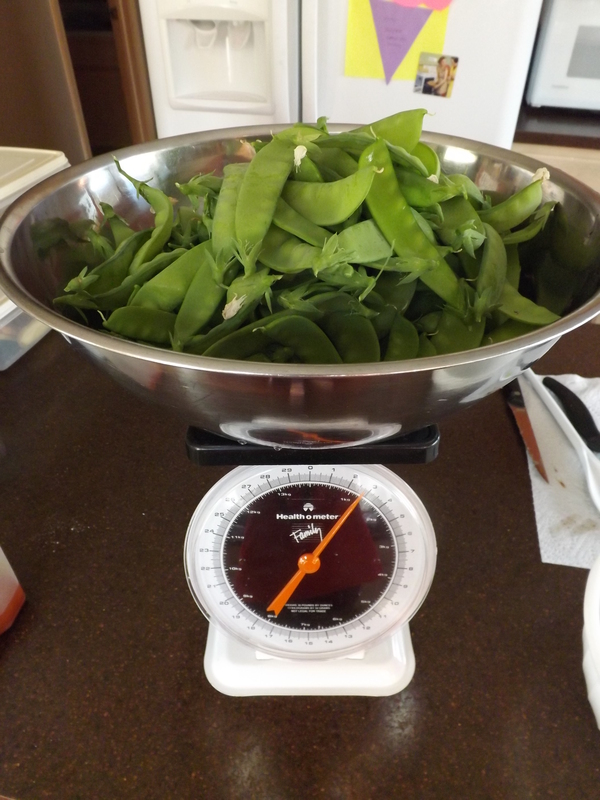 The other day I picked more than 2 1/2 pounds of fresh pea pods. 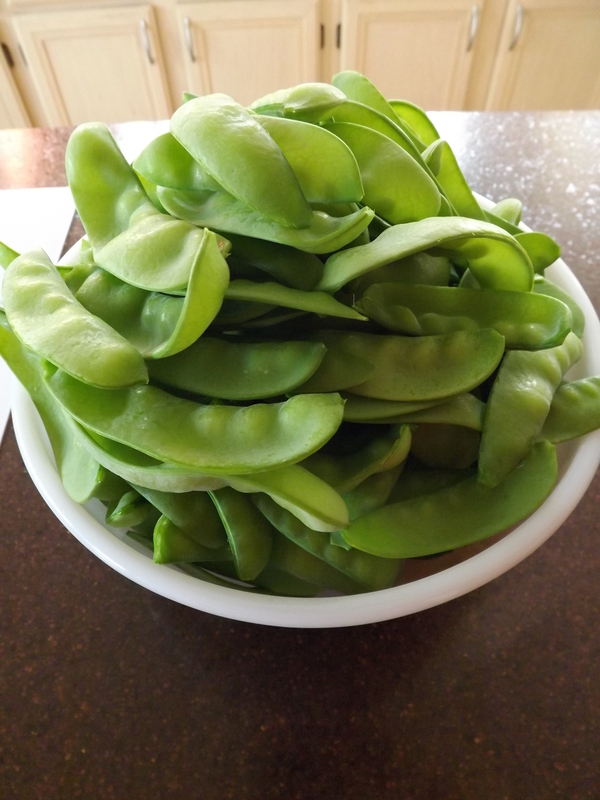 Actually I was supposed to be picking pea pods and snow peas, but all of my snow peas which are supposed to be puffy, were flat as well, so I picked them right along with the pods. It’s possible the seeds got mixed up, because when I checked online as to why they would be flat and very large, there was no explanation. My conclusion was then that either the seed packet was mismarked or I planted the wrong seeds. Chances are I screwed up, but in any case, the pods are sweet and tasty and now frozen for use later in the year when the garden shrivels and dies. 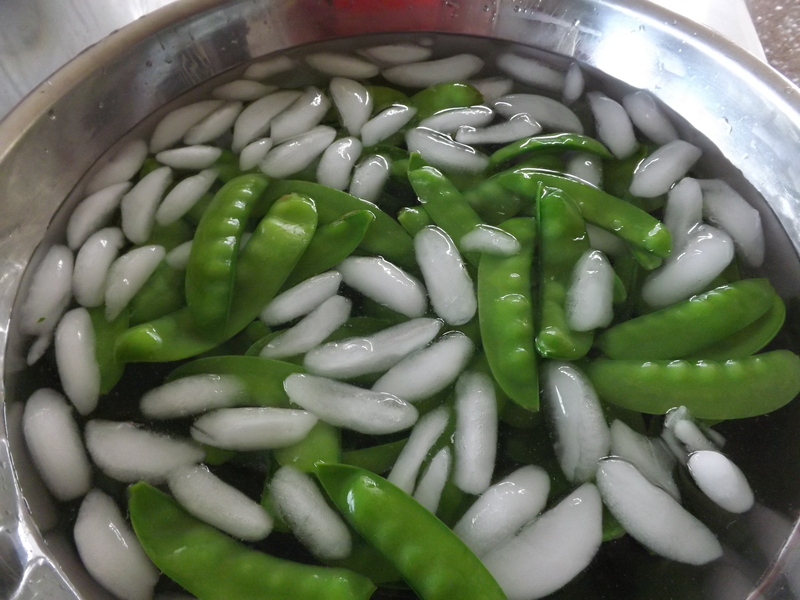 I had never frozen pea pods before, but it was very easy and pretty quick. 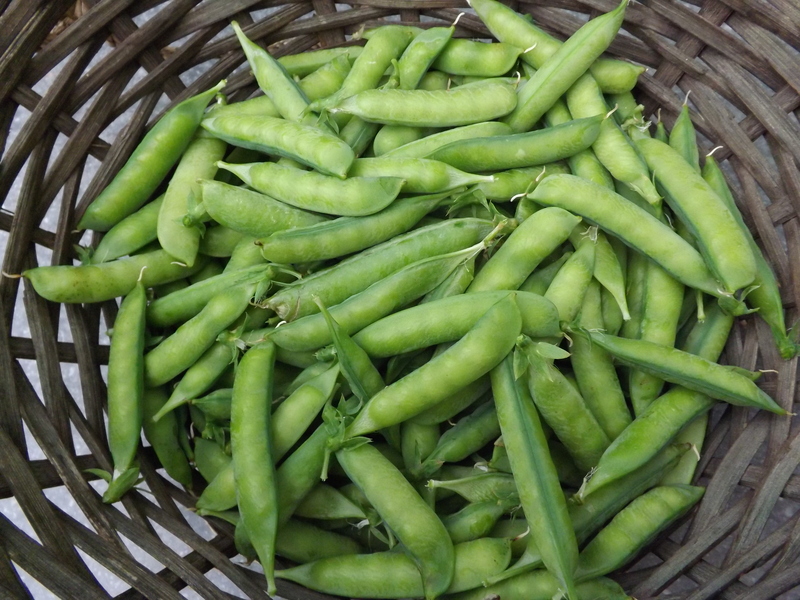 First, start with your freshly picked pea pods. Next trim off the ends and pull of any stringy seams. While working, set a large stock pot full of water on the stove and bring to boil. 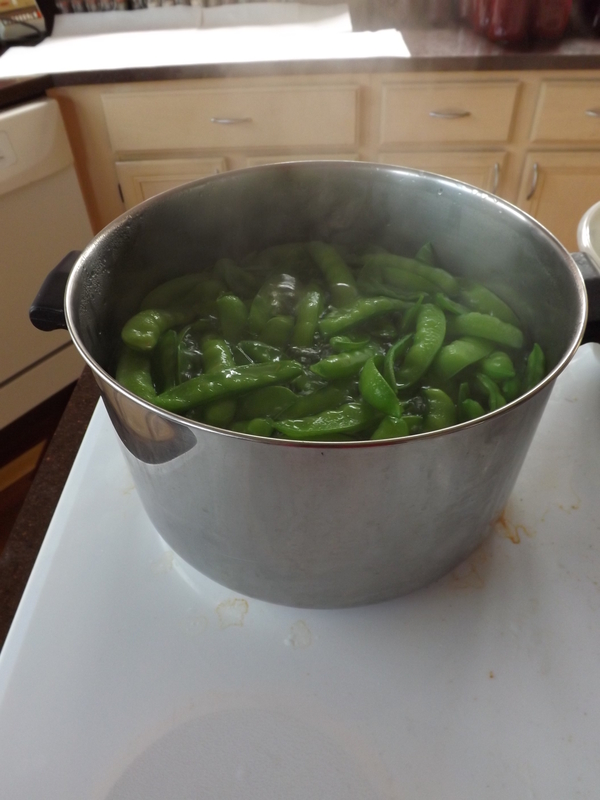 Once prepared, drop the pea pods in batches into the boiling water and boil covered for two minutes. Immediately remove from boiling water and immerse in bowl full of cold water and ice for 3 minutes. 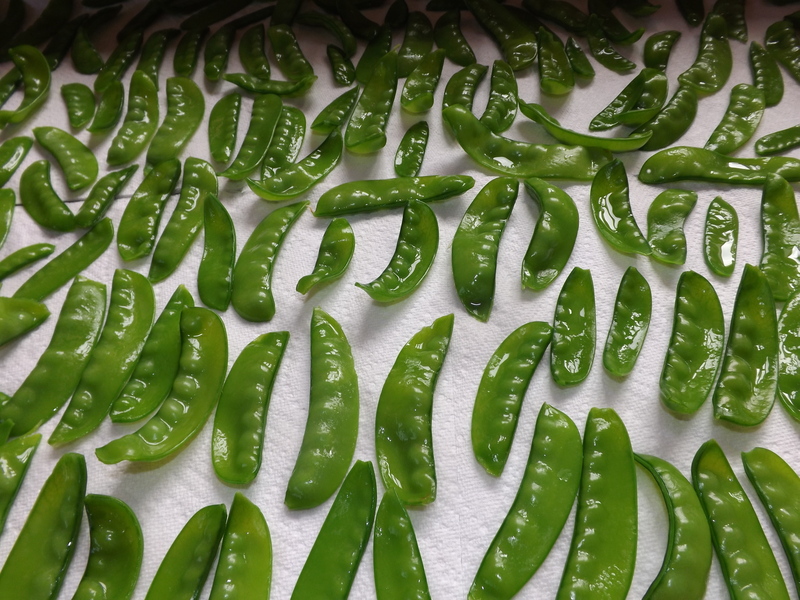 Spread pods out on paper towels to dry. Then all you have to do is pack them in freezer bags or bowls, label, and freeze. I have three quart size bags full of pods in the freezer and can’t wait to pull them out come winter. For now I’m enjoying eating more fresh pods daily. We’ve had three meals with fresh pods, using at least another pound. Can’t wait to see how many pounds the garden ends up yielding. 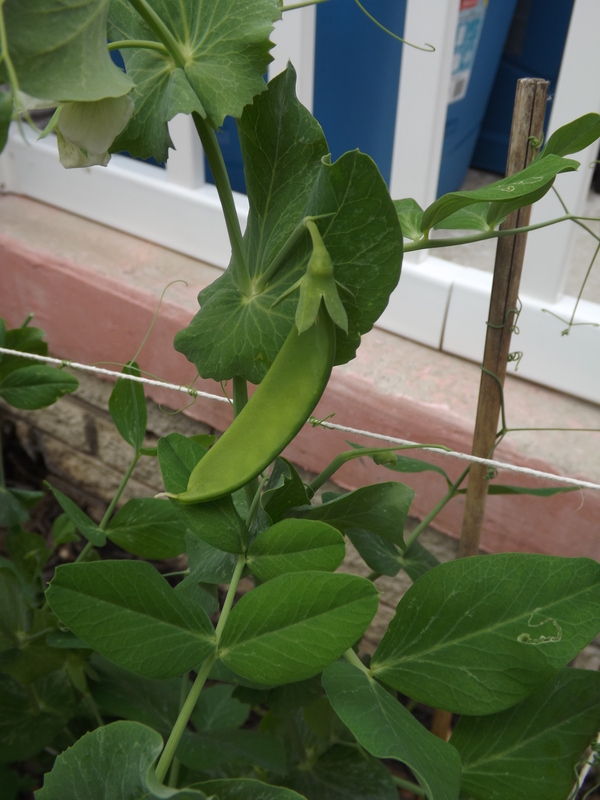 Even if I didn’t get the snow peas I was hoping for, I will take the pea pods any day of the week. They can be added to any dish I would have used the snow peas in, and for this I am — Simply Grateful. One of the most versatile and commonly used strawberry concoctions that I can is strawberry glaze or gel. I use this from strawberry pie to strawberry Belgium waffles to a substitute for strawberry syrup to strawberry ice cream topping to strawberry shortcake. It can be used for practically anything and in a pinch, I probably have. Strawberry glaze/gel is sold in the stores all year-long, but in my opinion, the store-bought versions taste like perfume. I know that may sound like a weird correlation, because who actually eats perfume, but that is the best description I can make of the taste. Homemade gel is so much better and being that I use Clear Jel to make it, it’s ready to use right out of the jar. Combine strawberries and 12 cups water in large stock pot. Bring to boil and simmer for 10 – 15 minutes. 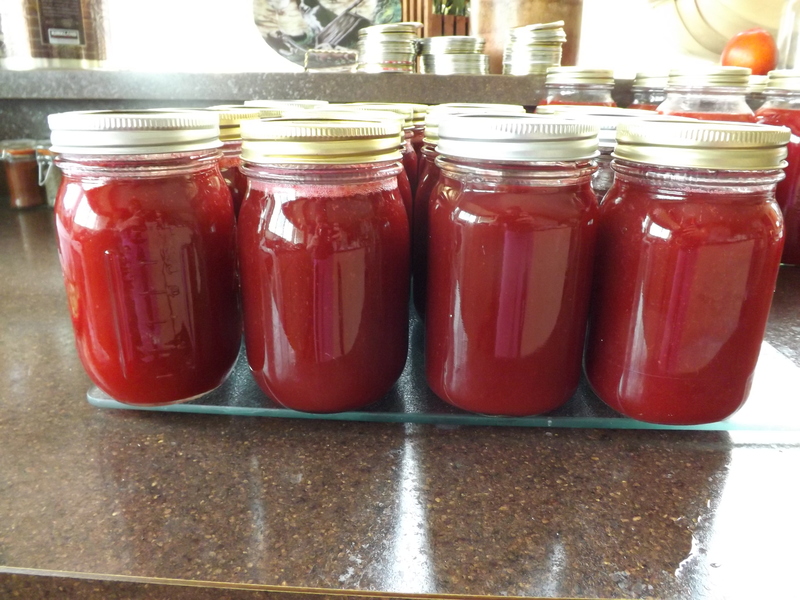 Run cooked berries through food mill or strainer and return juice to stock pot (I got 22 cups of juice after straining). Add lemon juice and sugar and bring to near boil. Combine Clear Jel with water and add slurry to stock pot. Bring to boil and boil for 1 minute. Ladle into hot jars, seal and process in water bath canner for 10 minutes. The pantry is stocked with 16 pints of Strawberry Glaze. I am thrilled and looking forward to a winter full of strawberry goodness, and for this I am —Simply Grateful. One of the quickest canning projects I like to tackle is any sort of mixed fruit lemonade concentrate. Last year I made quite a few of these and have not exhausted our supply of strawberry-lemonade yet, so this year I decided to combine strawberries with cranberries and make a new concentrate. The results were tart and refreshing. Combine strawberries and cranberries in large stock pan and bring to boil slowly. As the berries begin to juice, use a stick blender to puree. Bring mixture to full boil and boil for 10 minutes. Remove from heat and run puree through food mill or mesh strainer to remove seeds and skins. Return strained juice, approximately 7 cups, to stock pot and add lemon juice and sugar. Bring concentrate to boil until it reaches 190 degrees. 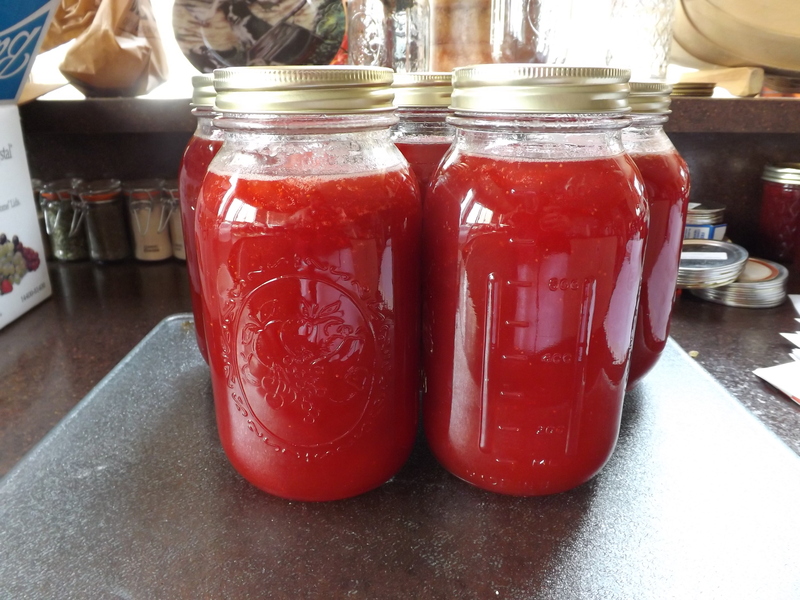 Ladle into hot jars and process quarts in water bath canner for 10 minutes. This recipe made 5 quarts. To reconstitute, combine 1 quart of concentrate with 1 quart of water plus more to taste. I love lemonade concentrates and having a new one to enjoy this summer into the fall is a treat, and for this I am — Simply Grateful. 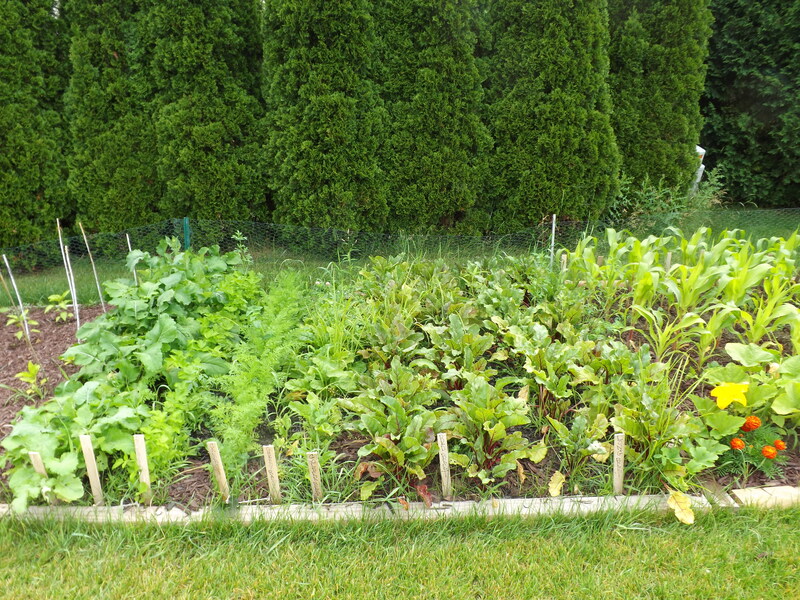 One of the greatest parts of having a garden is being able to “run to the garden” rather than “run to the store” when I need a carrot, some scallions, a few peas, or some greens. 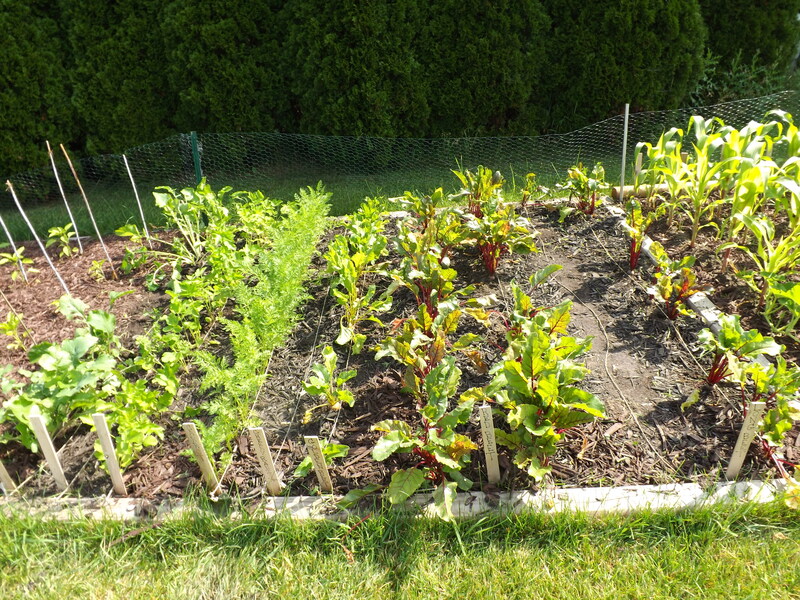 In a couple of weeks, possibly as long as a month, there will be even more vegetables that I’ll be able to walk out the back door and harvest from the garden. The other day while making some soup for dinner I realized I didn’t have any carrots. 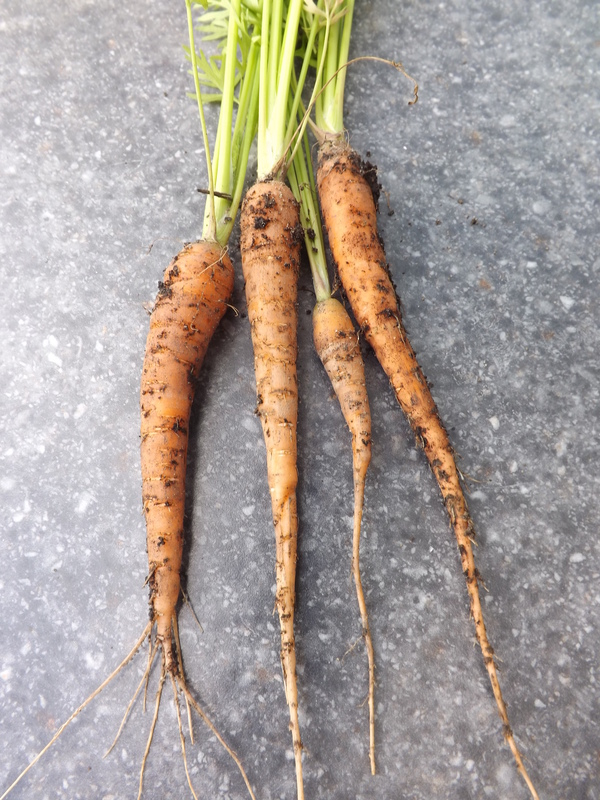 Even though our carrots are still a bit young, I headed out to the garden and picked just a few to put in the soup. They really hit the spot and were just what the soup needed to make it the best it could be. There are so many rewards to be gotten from gardening — one of the best being the bounty, and for this I am — Simply Grateful. WHY DO THE WEEDS GROW EXPONENTIALLY TO THE PLANTS IN MY GARDEN? 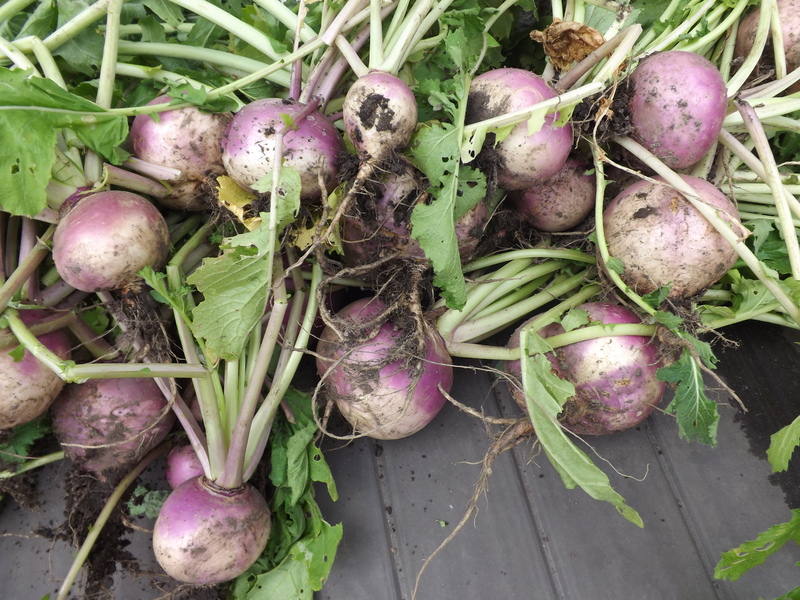 Weeding has become a weekly chore for me, but with three separate gardens and some being too big to weed all in one day, this means a minimum of four days a week I am out there weeding. 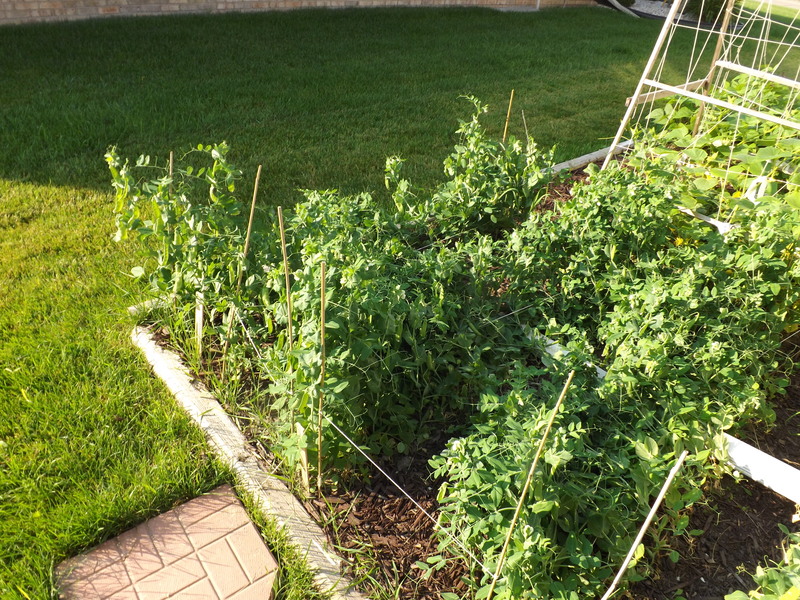 What frustrates me is regardless if I weed today, leaving nothing but clean, brown dirt surrounding my plants, in a week there will be weeds larger than the plants that have been in the ground now for nearly two months. How can this be? Whatever type of growth hormone these weeds are taking, I want some for my plants. Can you image how big my pepper plants would be if they had half the growing power the out-of-control weeds have? 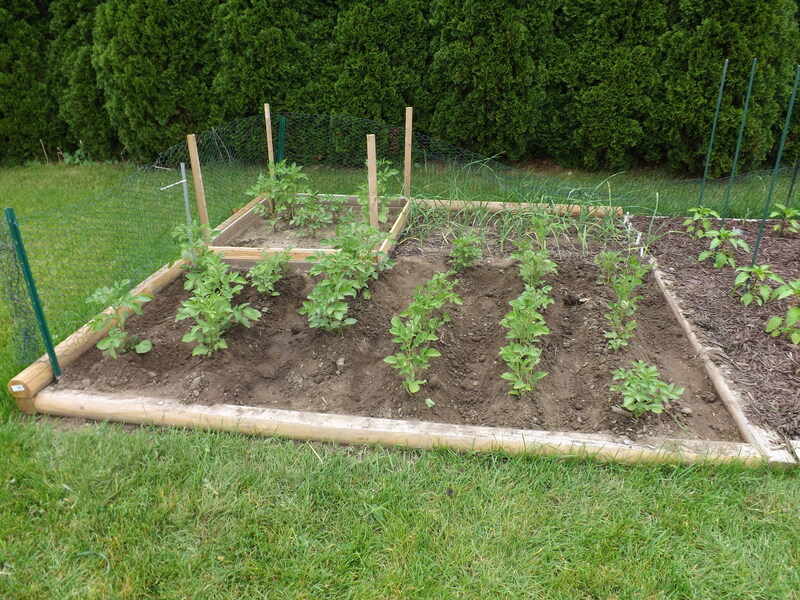 When I cleared away the weeds, broke up the soil and hilled the potatoes, this is what it looked like. Quite a difference, at least to me. I know this time next week it will need it again, but for now I am content to admire a job done, and for this I am — Simply Grateful. 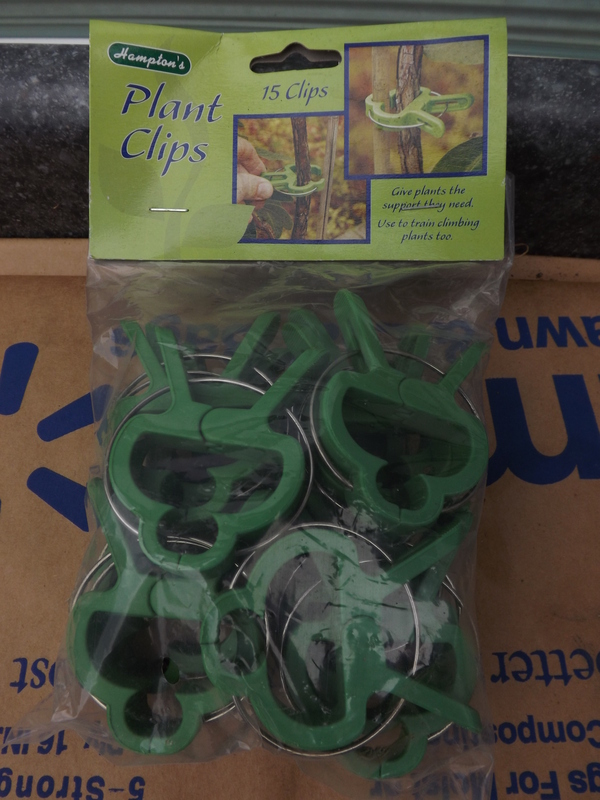 Several weeks ago while at a garage sale I happened upon two bags of these garden clips. At first I almost didn’t get them. 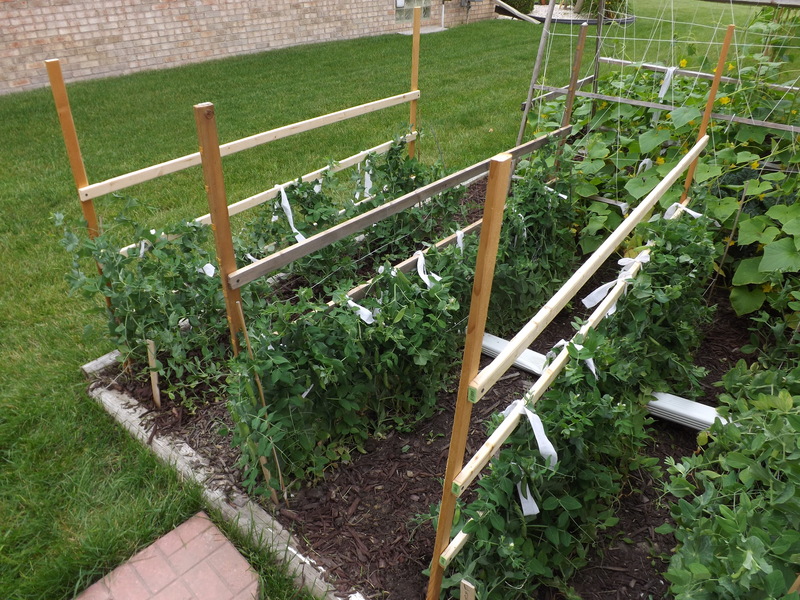 They were $1.00 per pack after all and at the time I was happy with the way I had been staking my tomato plants. I did buy them though thinking I could use them to quickly hook cucumber vines to the A-frame if nothing else. 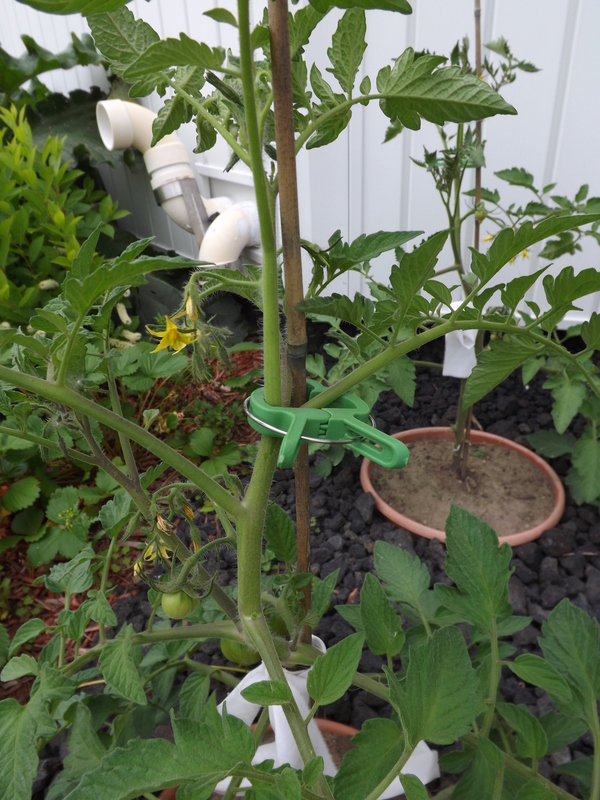 Well, after my fiasco with using the twist ties to stake my tomato plants (see my post Staking Tomatoes – A Near Devastating Mistake) and then using torn up sheets, I remembered I had these this morning and decided to give them a shot. 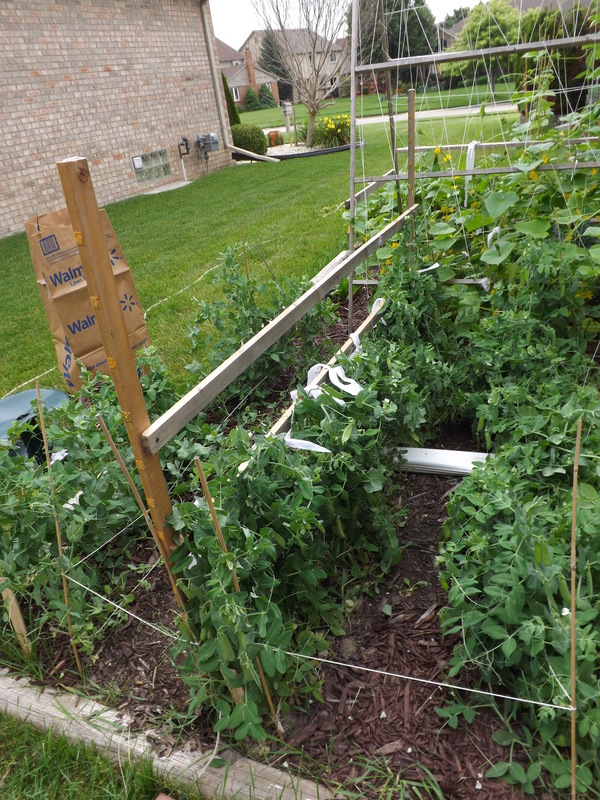 Even though I staked my tomatoes just a little over a week ago, they have already become unruly and several of them were starting to topple over from the weight of the unstaked stalks that have grown well above the strips of sheet holding the plants to the stakes. Taking just a few with me to the tomato garden I found the plant that was in need of staking most and snapped a clip on it. OH MY GOSH! That’s all it took. 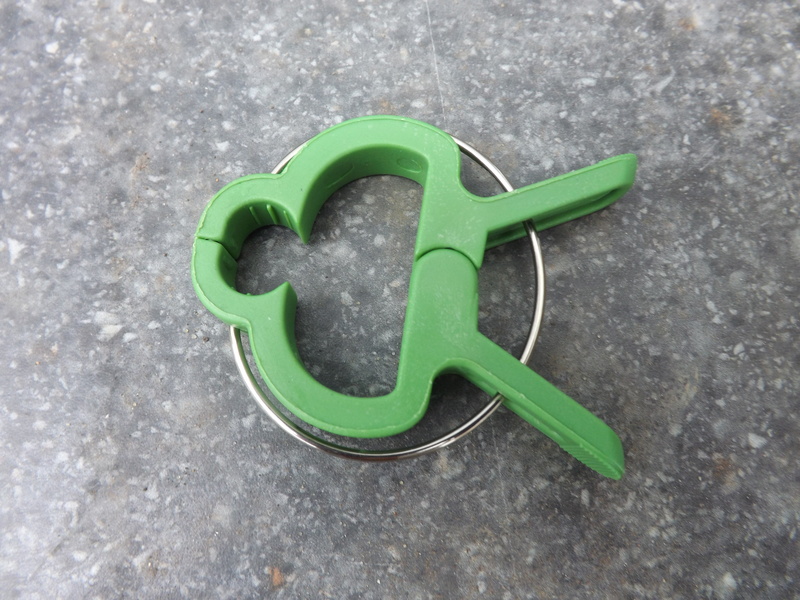 Less than 5 seconds to grab on to the stalk, hold it against the stake, and attach the clip. No fighting with the stalk while I try tieing a flimsy piece of material around it and the stake, all the while doing my best not to allow the tomato plant to touch any of my bare skin because I get terrible hives from tomato plants. Nope, just straighten, hold, and clip. What a great invention. These are definitely a garden-gadget-must-have for me! I found several types of these on Amazon and have ordered three packs of 20 with 2 different sizes in them. They cost $4.94 per pack with free shipping, so I guess the $1.00 per pack of 15 was a phenomenal price. I won’t hesitate to pick these up again if I run across them in a garage sale. 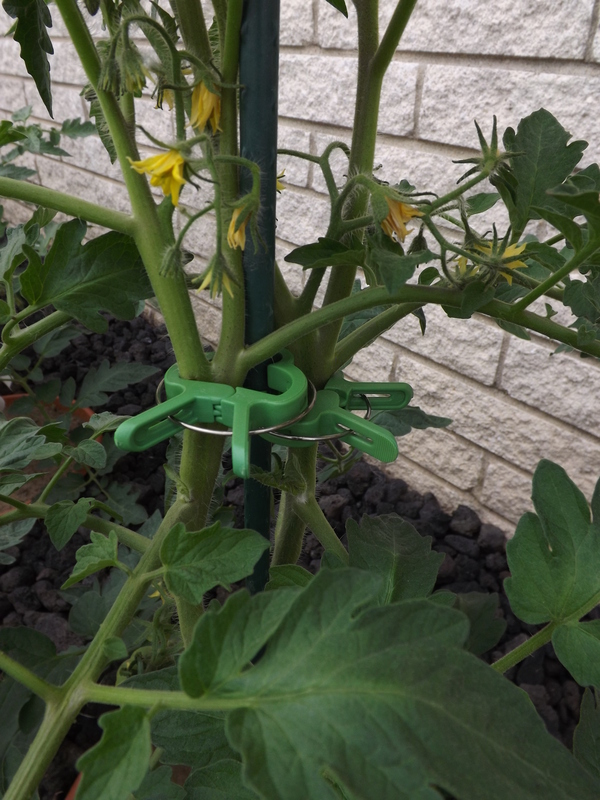 I’m thinking once my pepper plants take off, which I’m hoping will be any time now, I can use these clips to keep their stalks in line with the stakes too. This plant needed two clips because the main stalk split into a V and I left both to grow. Looks like I’ll be needing another stake for this plant now. Sometimes it’s just a little thing that can make life easier, and for this I am — Simply Grateful. 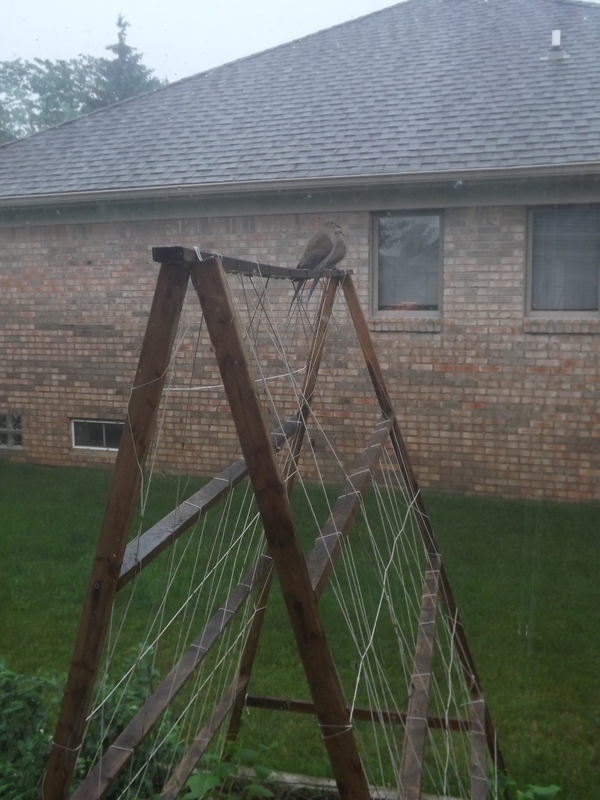 This afternoon we had some severe thunderstorms hit our area. The rain came down in buckets, thunder and lightning filled the sky, and the streets quickly filled with water. 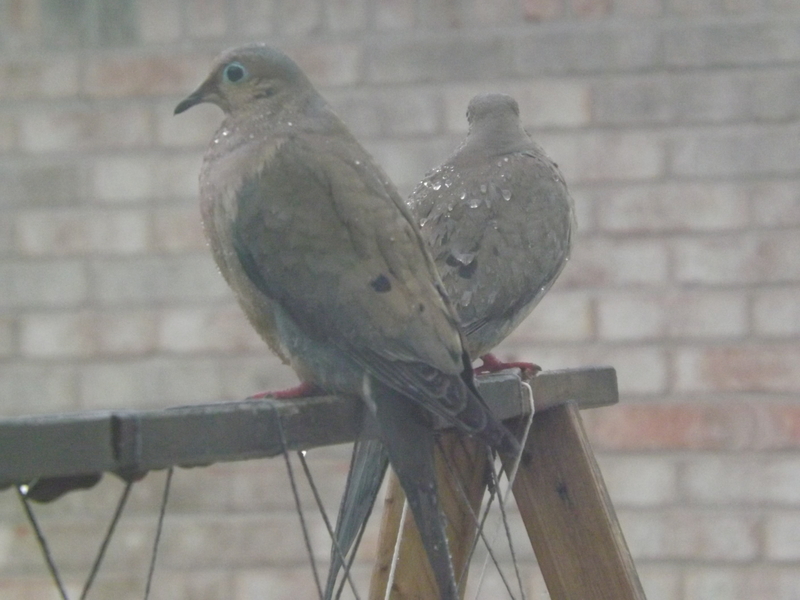 As I sat listening to the storm in our great room, I suddenly heard the distinct cooing of a morning dove. 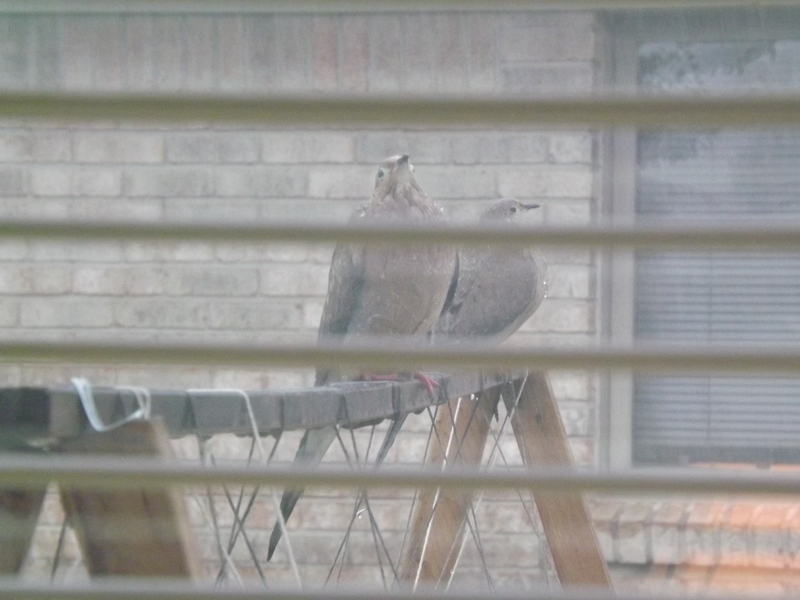 I carefully opened the shade on the window overlooking the A-frame in the cucumber garden and there on top of the structure were two soaking wet morning doves. 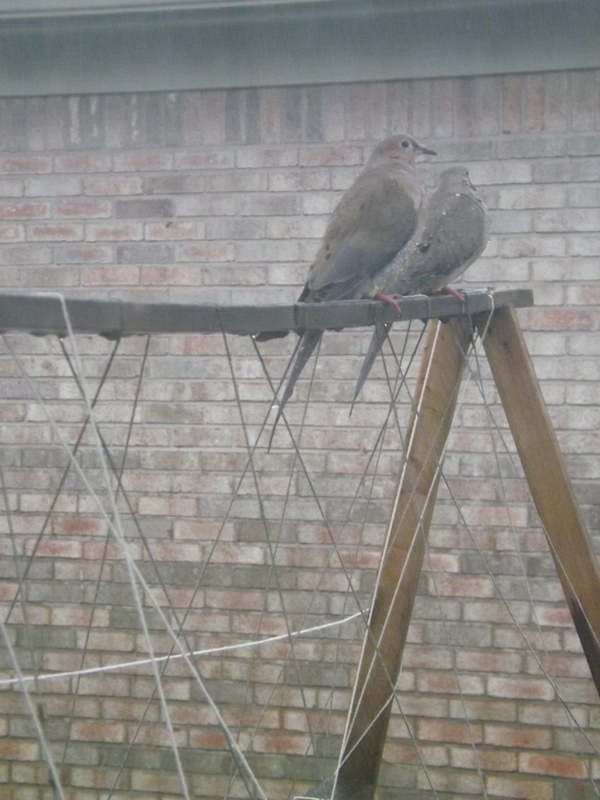 This couple must have gotten stuck in the storm. I am not sure if it’s true, but I heard that birds will not fly in a storm. 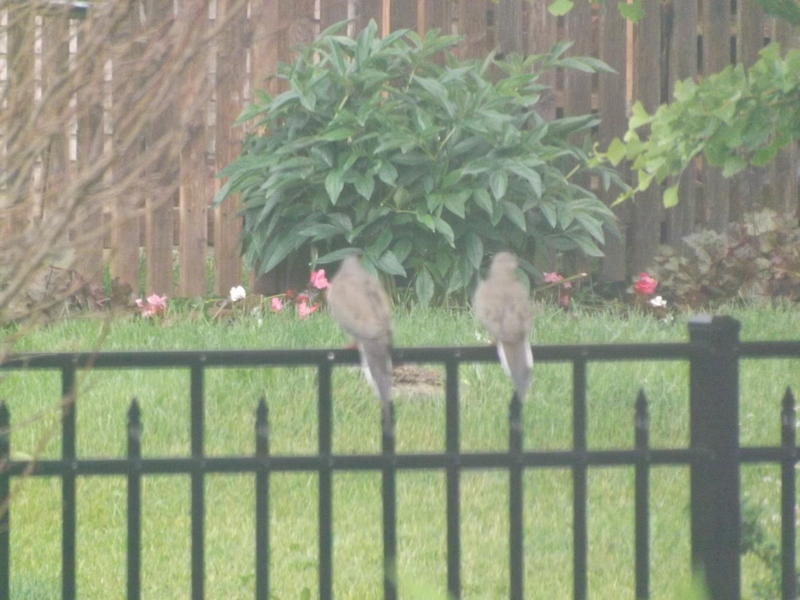 Seeing this pair of birds patiently sitting in the rain, not daring to fly, makes me think this may be so. 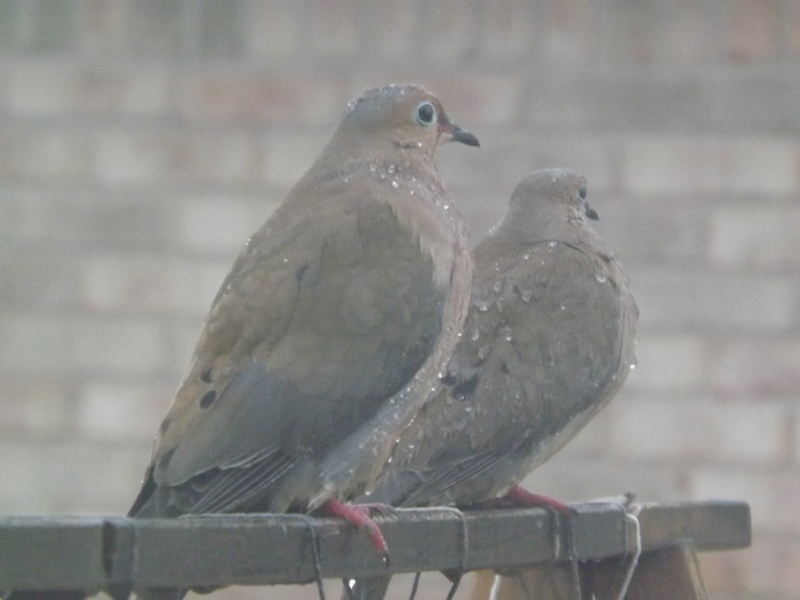 For more than an hour the rain pounded them, but neither made any move to leave. 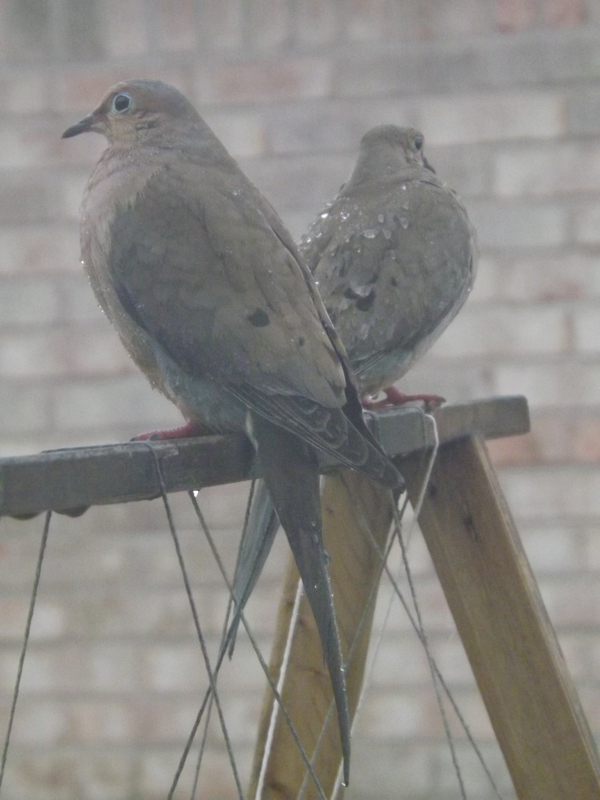 Not until the rain stopped and they had fluffed themselves somewhat dry, did they take flight. and then finally into the safety of a pine tree. All the while, they were together, never faltering, as one. 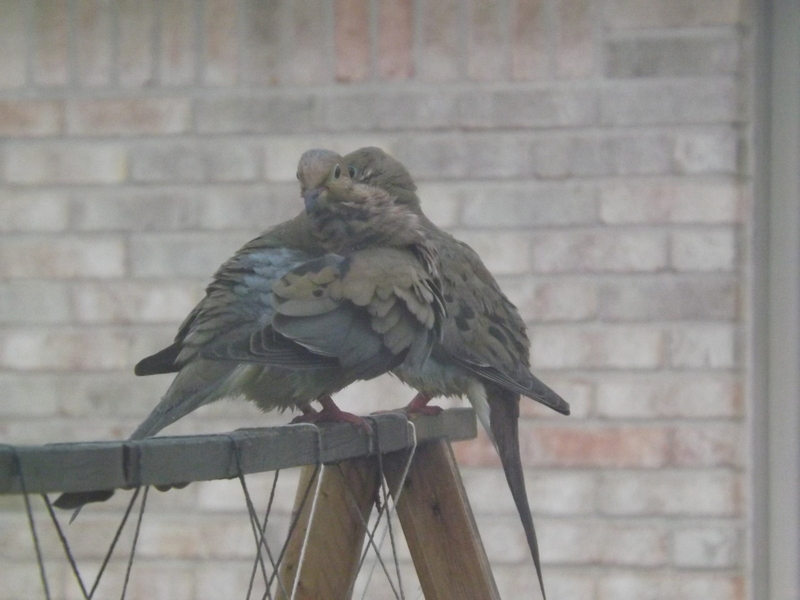 Love can be found everywhere, but today it was right outside my window and for this I am — Simply Grateful. A few weeks ago the dill I planted for canning pickles this year began to sprout and quickly took over the pot I had given it. Last week, however, I began to notice that the pot seemed to be shrinking, or at least the thriving dill inside it. Upon closer inspection I discovered tiny caterpillars crawling among the dill. At first I thought they were Monarch butterfly caterpillars. We had raised Monarch’s several years ago, so I was familiar with them. 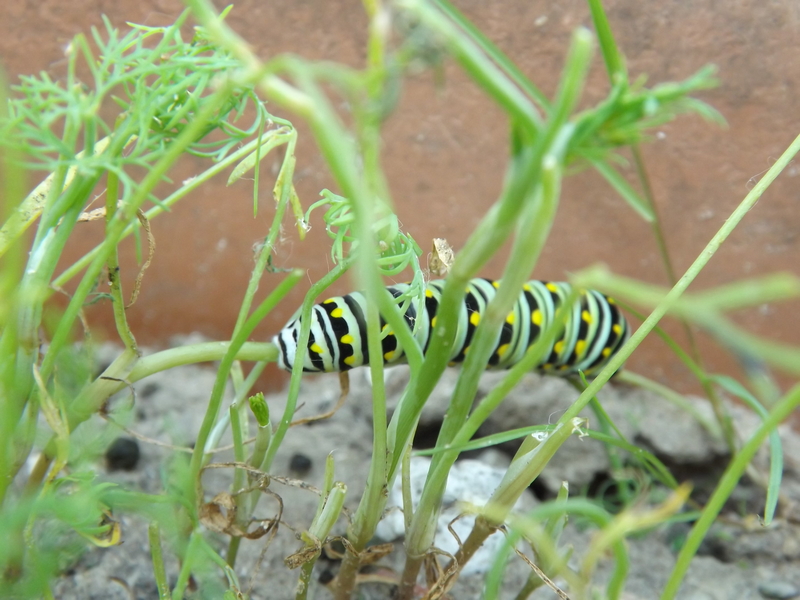 These caterpillars looked nearly identical to the Monarch’s, but seeing as these little guys were eating dill and not milkweed, I knew better. Monarch’s only eat milkweed. After I told Grace about them, she did a little research and informed me that what we had were swallowtail butterfly caterpillars. 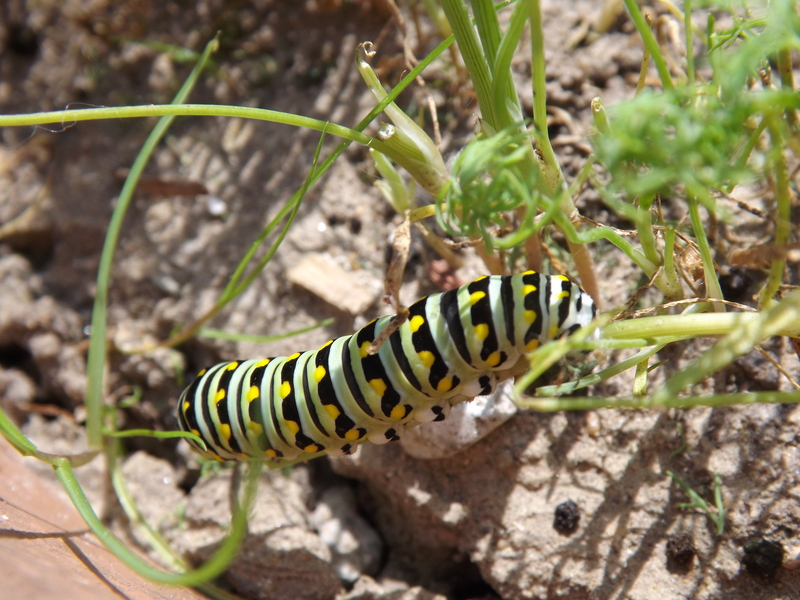 These caterpillars eat fennel, dill, carrot tops, and a few other greens that I have planted throughout the yard. The only place I found the caterpillars however was on the dill. Grace, knowing that I am a sucker for all things nature, asked if she could keep the caterpillars. We read up on them and found that although these caterpillars were nearly ready to form their chrysalis’, they could stay in them for up to a year. This would not work in our house. Monarch butterflies emerge from their chrysalis 10 to 14 days after they are formed. Waiting an entire year and maintaining a healthy environment for a swallowtail chrysalis was not something I believed we could do. 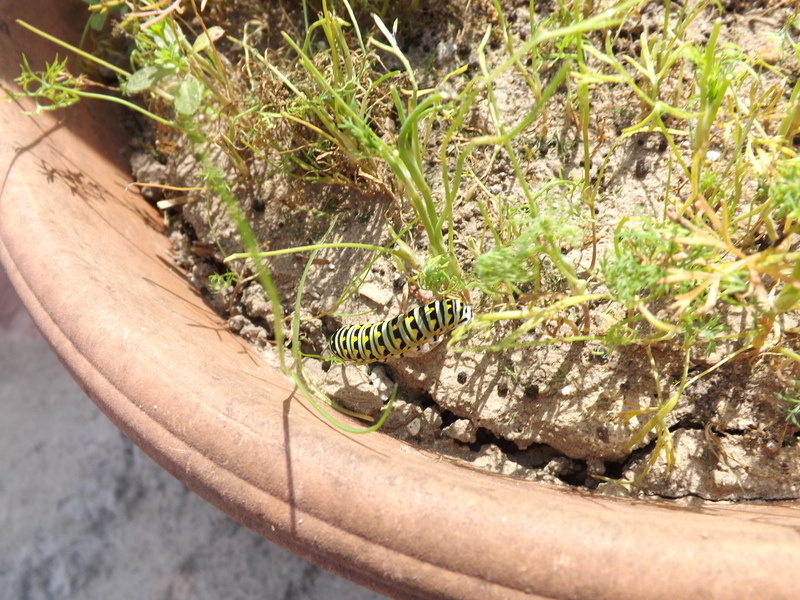 Still, Grace pleaded for me not to remove the caterpillars from their happy temporary home in the dill. Even though leaving the caterpillars in the dill to continue eating before the long sleep in their chrysalis might mean no dill for canning this year (at least home-grown), I agreed. What’s a little dill in the scheme of things? 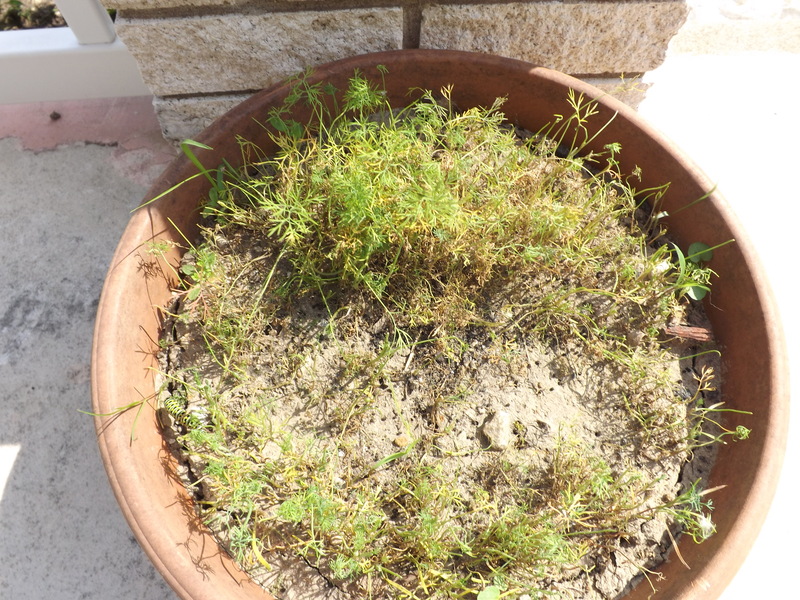 Most of the dill has been eaten right to the roots. Oh well, better luck next year. So, for the past week we have watched as the tiny caterpillars ate and grew and today I can report that all but one has moved on to find a comfortable, safe place to form its chrysalis. It is amazing how they just seem to disappear from the pot with no sign of them anywhere. Next year I will be sure to plant at least two pots of dill and perhaps some fennel too. This way maybe I’ll have enough to feed the swallowtail caterpillars and save some dill for canning. So begins my gardening to do list for 2016! The dill is all but eaten to the roots, but at least there is comfort in knowing we might have had a hand in a few more swallowtail butterflies gracing the world with their presence, and for this I am — Simply Grateful.